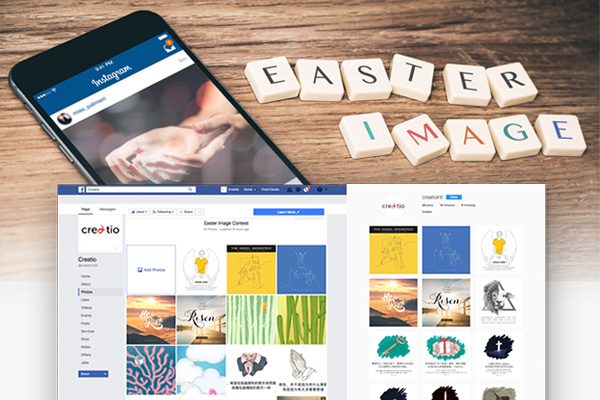 Creatio’s Easter Image Contest is ongoing during Holy Week until Easter, from April 9th until 15th. Many Creatio artists and designers around the world are participating in this event. The graphic arts are being exhibited on Facebook and Instagram and Creatio’s exhibition website. Holy Week means the “Holy and Great Week” in Greek. It is the last week of Lent that leads up to Easter. Holy week includes Palm Sunday, Holy Monday, Holy Tuesday, Holy Wednesday (Spy Wednesday), Maundy Thursday (Holy Thursday), Good Friday (Holy Friday), and Holy Saturday. It is also the week of suffering because Jesus experienced the crucifixion. Creatio planned for this event to meditate and commemorate the event of Jesus’ death and resurrection. When Jesus was resurrected angels came down and shared the good news to Mary Magdalene and she became the witness. Just as Mary Magdalene, Creatio hopes that through this event many Christian artists and designers can become the messengers of the Good News. The images are available to view on Creatio’s Facebook & Instagram. Like and Follow Creatio today! Creatio will continue to use social media actively as a tool of spreading the good news of Jesus Christ.